Now you can dramatically reduce label costs, increase operational efficiencies and quickly produce high-quality colour labels with Epson�s TM-C3500 label printer. Today there is a growing demand for the use of colour labels that feature colour codes, photos and pictograms to highlight relevant information. This trend sharply drives up the number of label variations and increases label production complexity. 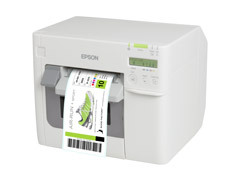 Epson’s TM-C3500’s ability to produce full colour labels on demand makes it the ideal solution. Epson’s compact, four-colour TM-C3500 inkjet printer features fast printing speeds up to 103mm/second1, a banding reduction mode and a nozzle check system that produces a reliable output of high volume labels with excellent image quality. In addition, it offers multiple easy-to-use features such as an autocutter, easy paper loading and an LCD with printer status readouts. 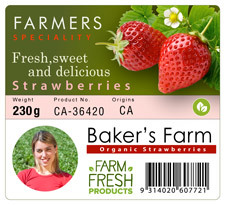 Epson’s patented MicroPiezo� inkjet technology together with our DURABrite� Ultra Pigment ink ensures labels with crisp, clear, easy-to read text and barcodes and vibrant graphics that resist smudges and water even on plain paper. And with the TM-C3500 you can print on a wide range of media from plain, synthetic and matte to glossy stock. It handles roll-fed or fanfold, die cut or continuous label media. With Epson�s TM-C3500 printer you can dramatically reduce the cost of your label operations. Instead of maintaining an expensive inventory of preprinted labels, you can print the labels you need when you need them. In addition, the TM-C3500 features individual ink cartridges for a more efficient use of ink and a very low cost of maintenance. The TM-C3500 delivers the quality and reliability that Epson is known for and is backed by Epson�s industry leading service and support programs. 1�Print speed is based on 56mm print width bidirectional mode, with banding reduction disabled in 360 x 360 dpi resolution. 1 Inkjet cartridge yields vary considerably for reasons including item printed, print settings, temperature and humidity. Yields may be lower when printing infrequently. A variable amount of ink remains in the cartridge after the “replace cartridge” signal. Ink from the first cartridge is used for priming the printer. Ink is used for both printing and print head maintenance.